Why does a president-for-life call snap elections? 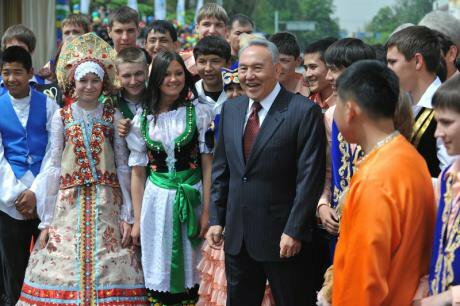 Throughout its recent history, the Republic of Kazakhstan has known only one leader – Nursultan Nazarbayev. After the break-up of the Soviet Union in 1991, Nazarbayev was the last to withdraw his republic from the Soviet Union and, with over 91% of the vote, secured his place as a democratic leader in Kazakhstan’s first elections – though he ran unopposed. The snap elections scheduled for 26 April are not Kazakhstan's first 'premature' referendum. In 1996, 2000, and 2011, either Kazakhstan’s parliament or President Nazarbayev moved up elections by several months, citing the watchwords of stability and progress. When the 2011 election was contested, parliament was dissolved and 2012 elections were a victory for the ruling Nur Ortan (Radiant Fatherland) party. Now 74, Nazarbayev is looking ahead – far ahead – as he tries to leave a legacy. The announcements haphazardly taped-up on the back of the office door are not usually of any importance to anyone at this university. That's why nobody reads them. Today, though, the sign states that every student and faculty member of the university is strictly required to show up and sign a petition asking President Nursultan Nazarbayev to run in Kazakhstan’s snap elections in April. Not only is this obligatory, but names will be counted, signatures checked, and passports verified for identification. But maybe, just maybe, if enough people begged him, he might just change his mind. Unlike most notices pasted to the back of the office door, this one is backed up with announcements over the loudspeaker. It is discussed by students and faculty over lunch. Every single third period class is interrupted in the form of a personal visit from an administrator. Any and all complaints should be directed to the dean's office. The dean, we can reasonably assume, will do one of two things. He will either simply ignore the complaints or he will place the complainants' names on a secret list – the sort of list you really don’t want your name on. A view of the new capital of Kazakhstan, Astana. (c) Marina Gorobevskaya / Demotix. Many people in Kazakhstan don't think much of their medical care. People often use the term ‘our doctors’ when discussing the issue. ‘“Our doctors” couldn't diagnose me,' they say. Suspicion and doubt are inherent in this phrase: 'Our doctors' are far from honest. Treatments unavailable in Kazakhstan involve shipping someone abroad to a private hospital in Germany or Israel where, for example, advanced chemotherapy and radiation treatments cost hundreds of thousands of dollars for the foreign, uninsured sick. This translates into pathetic pictures of patients photocopied and posted all over town, in buses and cafes, describing the stage the disease, and begging for money. One bus window advertised a benefit concert for an ailing two-year-old girl. But for someone forced to sign a political petition at the risk of unknown consequences (which are, as a rule, more frightful and intimidating than known ones) the question 'Why?' begins to resonate. Why are they taught in school that their homeland has deposits of every element on the periodic table, an abundance of oil, and strong manufacturing infrastructure, and yet they live as they do? Why does one of the president's son-in-laws run the state bank, and another hang himself in an Austrian prison? And why does a president who has been formally elected 'Leader of the Nation' need to call snap elections? Why does a president who has been formally elected 'Leader of the Nation' need to call snap elections? The last First Secretary of Soviet Kazakhstan, President Nazarbayev has steered his nation through the tumultuous 1990s towards a reasonable level of prosperity. Indeed, though one could argue the discovery of massive oil deposits have played as much of a role as skilled political manoeuvring, in 2010, Nazarbayev's talents were recognised when he was given the title of Elbasi (the leader of the nation) in a special election. President Nazarbayev in Almaty during the celebration of Kazakhstan People's Unity Day, 2012. (c) Vladimir Tretyakov / Demotix. In the end, a week after the announcement posted on the office door, a ‘reluctant’ Nazarbayev agreed to run in this election despite his ‘other plans’. Large blocks of voters have come out in support. The Fisherman's Union immediately came out in support. The Boxers’ Association came out in support. His own political party came out in support. Opposition political parties came out in support. Not to mention nearly every government-funded organisation. Against the background of such a massive public outpouring of support, how could Elbasi refuse? Unlike most elections, there is a little in the way of electioneering. Billboards remind voters that there will be a referendum, not whom to vote for. We don't see plastic signs stuck in front lawns, badges, televised advertisements or t-shirts. Not that most people even know who the opposition candidates are. The pattern of early elections is not new, nor is Nazarbayev's show of reluctance to run. Yet despite Nazarbayev's record of stability, the government is eager to prove its mandate – why? Since Kazakhstan's last elections in 2012, the international political landscape has changed greatly. The snap elections called by the legislature could be a prophylactic defence against a repetition of any 'Ukrainian scenario' in Kazakhstan. The northern part of Kazakhstan is inhabited by many ethnic Russians (a direct consequence of Khrushchev's Virgin Lands policy designed to increase farming output), and many ethnic Kazakhs are primarily Russian-speaking. Although their numbers have fallen since the fall of the Soviet Union, Russians still make up around 30% of Kazakhstan's population. Since the Ukrainian crisis began, Russians previously content living in Kazakhstan suddenly began using terms like 'we' more frequently when referring to Russians in Russia. They speak of what Russians want, how the West is treating Russians. They are more sensitive about what the West or anybody has to say about the Russian government. Perhaps Russian television channels are responsible – they are broadcast in Kazakhstan. But since the Ukraine crisis, there is an increasing fear that ethnic Russians who were happy to live under Nazarbayev want to live under a strong(er) leader – Vladimir Putin. 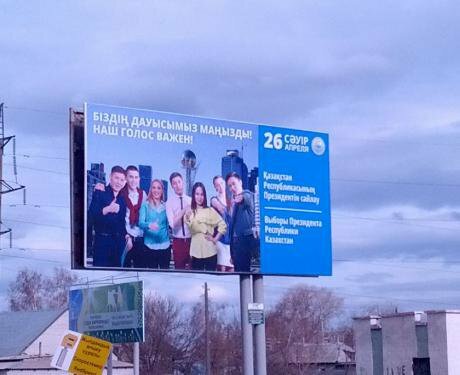 Election billboard in Northern Kazakhstan. Image courtesy of the author. The Kazakh people know their roots. It's no accident that Nazarbayev comes from (or claims to come from) a ‘White Bone’ family (one who can trace its roots back to Genghis Khan) of the Old Jüz, which has for centuries lead the three main nations of Kazakhstan. With control of Kazakhstan’s prized oil fields firmly in Kazakh hands, Russian interests are unlikely to take hold of the economy. Kazakhstan's links to Russia are far less 'ancient' and pronounced than Ukraine's. Its people are not Slavs. One of the most talked about aspects of these elections is the so-called 'Linguistic Question', a test of the Kazakh language which only 3 of the 16 potential candidates were able to pass. The test serves as a reminder to Kazakhstan’s ethnic Russians that they are in Kazakhstan, not Russia. To Nazarbayev's credit, he didn't simply accept the pre-existing Soviet borders of Kazakhstan, but negotiated them in separate treaties with Kazkhastan's neighbours. There are documents attesting to the validity of these borders that one could use, say, in international court should a dispute arise. The 'we are taking back what's ours' argument used in Crimea does not hold in Kazakhstan. Overall, while ethnic tensions don't resonate with the people, or the government, economic issues certainly do. Many people honestly feel that Nazarbayev has led the country through a difficult economic period. Still, Kazakhstan has trouble obtaining foreign investment. In 2014, Nazarbayev actually took the measure of proposing to change the name of the country to Qazaq Eli, a Turkic equivalent of ‘Kazakhland’, to distance itself from the perceived negative connotations of the ‘-stan’ suffix which were alienating. 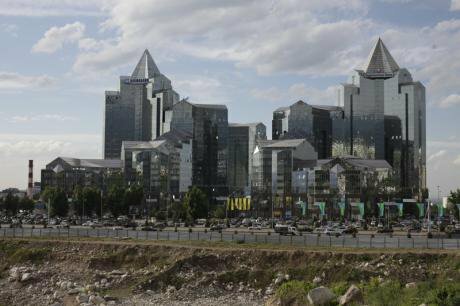 Kazakhstan sounds too 'Stany' – and therefore weak – to foreign investors. Nazarbayev noted that Mongolia gets plenty of foreign investment when their economy is much less promising. Meanwhile, Nazarbayev's plans to modernise the county in sweeping reforms keep getting pushed back. The president's legitimacy rests on the notion that it would be too risky to change leadership while Kazakhstan is still recovering from the Soviet Union 25 years after it dissolved. The government has continually insisted that prosperity is contingent upon centralised power, no matter the cost. The country is the most wealthy of the former Central Asian Soviet republics and, though the standards of their oil refineries and factories might be lacking, the Kazakh government has made it its business to attract to foreign investment. Kazakhstan has set up study abroad and English language programmes to attract foreign expertise. In fact, the government's 2050 strategy involves attracting foreign investment, building manufacturing and refining infrastructure so that Kazakhstan doesn't have to rely as heavily on foreign companies. The end result will hopefully be a more diversified and competitive economy and prosperous country. Nurly Tau business center in Almaty, Kazakhstan. (c) Marina Gorobevskaya / Demotix. The question is, though: why is the recovery taking so long? Kazakhstan's per capita GDP per capita is almost as high as Russia's, and many times higher than Central Asian and Caucasian republics. They have trading partners. There is work. People may not be happy with their salaries (who isn't? ), but they aren't starving. They have their own businesses, their own real estate. The Kazakh currency, the tenge, looks healthy compared to the Russian rouble. People have something to lose and life is getting better. This is all good for everyone, except that when Kazakhstan does emerge as a fully modernised country, the need for a president for life will have vanished. The 2050 strategy is the third or fourth such endeavour, and the deadline for economic recovery continues to be put off further into the future. People may not be happy with their salaries (who isn't? ), but they aren't starving. 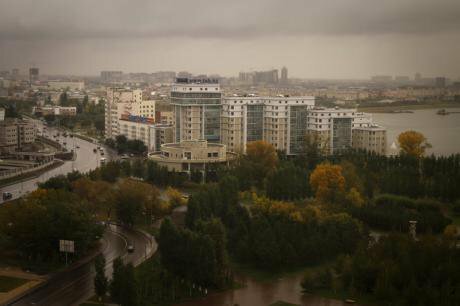 Kazakhstan is not a poor country and is unlikely to see a 'colour' revolution. Unlike poorer former Soviet Republics like Georgia, where major politicians fight on television and where most people feel their votes count, politics are not part of everyday life. Before the Rose Revolution in 2003, Georgians felt they had nothing to lose, and therefore nothing to risk, by protesting and eventually toppling their government. Now their salaries are some of the lowest in Europe, and Russia, in addition to occupying two Georgian territories, has imposed a devastating trade embargo. Volatile governmental power exchanges brought violent protests to Georgia in 2011, and new governments roll back the progress of their opposition predecessors. Architectural projects in Tbilisi are left unfinished like half-finished tattoos. The Kyrgyzstan Tulip Revolution in 2005 led to a second, violent one in 2010. The 2004 Orange Revolution in Ukraine has left a troubling legacy. On a fundamental level, the less predictable elections are, the harder it would be to plan to win them. Last year, the cancellation of Independence Day gatherings at universities took place, apparently, due to requests on Twitter and social networks for a show of solidarity among the educated youth. There were rumours of demonstrations in memory of the December 1986 Jeltoqsan uprising, when riots broke out in Alma-Ata in protest against Gorbachev's installation of a Russian First Secretary, to be held simultaneously on Independence Day. (Both events are comemmorated on 16 December.) These protests were violently suppressed by Soviet interior troops. Rather than deal with the demonstrations, the state banned the gathering at the last minute and declared a public holiday. Changing dates at the last minute to avoid conflict and prevent organisation is a tried and true technique. Aside from any degree of corruption or economic improvement, the government, even with all its control, feels the need to go through the motions of an election, and that institutions feel the need to force their workers to vote a certain way. Things since the 1990s have improved, and Kazakhs who felt they were second class citizens in the Soviet Union because of ethnicity no longer feel that way. It doesn't seem like the powers that be ought to be worried, yet muttered complaints about healthcare and economic issues give pause for though: maybe there is reason to be hesitant. Maybe the heads of government feel they may lose their grip. Maybe they are just going through the motions of democracy? Maybe early elections have always worked, so why experiment? Of course, making voting and public support for a candidate obligatory doesn't make people feel like they are being looked after. They're not fooled. But it does remind people who is in charge, and who is going to be in charge.